Hannan quarterback Matthew Qualls prepares to take a snap from center, during the Wildcats’ Week 2 loss to Green on Aug. 31 in Ashton, W.Va.
Last Week: Southern defeated Federal Hocking 57-6, in Racine; Wahama lost to Miller 40-0, in Hemlock. Last meeting between the teams: Sept. 8, 2017. Southern won 27-21 2OT, in Racine. SHS offense last week: 342 rushing yards, 99 passing yards. SHS offensive leaders last week: QB Logan Drummer 7-of-10, 99 yards, 3TDs; RB Trey McNickle 9 carries, 258 yards, 2TDs; WR Weston Thorla 4 receptions, 69 yards, 1TD. SHS defense last week: 54 rushing yards, 19 passing yards. 1. Despite the Tornadoes’ three-game winning streak in the series, Wahama holds an all-time 32-4 record against SHS. Southern’s last trip to Bachtel Stadium was on Sept. 9, 2016, and resulted in a 46-8 Tornado win. 2. Southern is looking for its third straight 3-0 start to the season, while Wahama is hoping to avoid a second straight 0-3 beginning. 3. The White Falcons have suffered back-to-back shut out losses for the first time since prior to 1995. Southern has allowed just two touchdowns this season, both rushing scores. 4. The Tornadoes have scored in a variety of ways this season, five times on the ground, five times through the air, once on defense, once on a kickoff return and once on a punt return. 5. This is Wahama’s first home game of the year, as well as Southern’s first road trip. WHS was 2-3 at Bachtel Stadium last year, after going 0-5 at home the previous year. SHS was 3-2 away from Racine last fall, making the second straight year that the Tornadoes had a winning road record. Last Week: Hannan lost to Green 86-14, in Ashton; Manchester lost to Miami Valley Christian Academy 58-0, in Manchester. Last meeting between the teams: Sept. 8, 2017. Manchester won 42-6, in Ashton. Current head-to-head streak: Manchester has won 2 straight. HHS offense last week: 31 rushing yards, 102 passing yards. MHS offense last week: N/A. HHS offensive leaders last week: QB Matthew Qualls 6-of-18, 102 yards, 1TD, 1INT; RB Jordan Fitzwater 5 carries, 18 yards, 1TD. HHS defense last week: 463 rushing yards, 0 passing yards. 1. Manchester holds a 2-1 record over Hannan in all-time meetings. The Wildcats claimed a 26-14 victory in the first-ever meeting between the teams, in Ashton in 2011, but Manchester won 36-28 at home the following season. 2. The 86 points allowed by Hannan last week is the most in over a two decades. HHS has allowed 80-or-more points three other times in that span, with Miller reaching 82 in 2015, Burch scoring 80 in 2010, and Buffalo hitting 80 in 2004. 3. 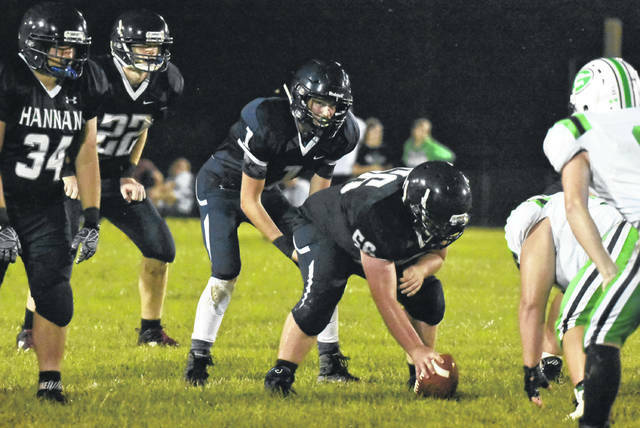 Manchester is still looking for its first points of the season, after a season-opening shut out loss at Fayetteville, and a 58-0 loss at home last Friday. 4. A week ago, Hannan allowed nine rushing touchdowns, as well as a pair of defensive scores. Meanwhile, Manchester gave up six rushing score, one passing touchdown, one interception return of a touchdown, and one field goal. 5. The Wildcats have lost their last 21 games played in the Buckeye State, having not won in Ohio since September 24, 1999, when they defeated host Eastern, by a 20-6 final. Last Week: Warren lost to Marietta 55-21, in Vincent; Point Pleasant defeated South Harrison 58-7, in Lost Creek. Last meeting between the teams: Sept. 8, 2017. Point Pleasant won 54-7 in Vincent. WHS offense last week: 9 rushing yards, 130 passing yards. PPHS offense last week: 310 rushing yards, 180 passing yards. WHS offensive leaders last week: QB Kurt Taylor 4-of-12, 119 yards, 3TDs; RB Kurt Taylor 11 carries, 40 yards; WR Brandon Simoniette 2 receptions, 87 yards, 2TDs. PPHS offensive leaders last week: QB Cason Payne 9-of-15, 160 yards, 4TDs; RB Brady Adkins 8 carries, 100 yards, 2TDs; Josh Wamsley 3 receptions, 42 yards, 1TD. 1. The Big Blacks have claimed 10 straight games over OHSAA opponents, having not lost to a team from the Buckeye State since falling to Warren in 2009. 2. Warren has lost 17 consecutive games, dating back to 2016. The Warriors haven’t won on the road since a 2013 victory at Gallia Academy. 3. The Big Blacks are home for the first time this season. Including the opening round of the 2017 postseason, Point Pleasant has won five straight in front of its home fans. PPHS has posted a winning home record in 10 consecutive seasons. 4. This is the 14th time PPHS and WHS have met on the gridiron. The series record is currently tied at 6-6-1. 5. Through two games, Point Pleasant has gained 981 yards and is even with opponents in the turnover column. A total of seven different plays have found the end zone for the Big Blacks this season.